SÃO PAULO, BRAZIL – Investments in Brazil’s education sector as a percentage of Gross Domestic Product (GDP) have increased from 5.8 percent to 6.1 percent between 2010 and 2011, according to a recent OECD report. However, Brazil still faces great challenges in improving the quality of education in the country. Public investment in education has increased, but Brazil still lags behind OECD countries, photo by Governo de Minas Gerais/Flickr Creative Commons License. The OECD report puts Brazil on the same spending level as developed nations like Italy and Switzerland, which spend both 4.7 and 6.1 percent, respectively. 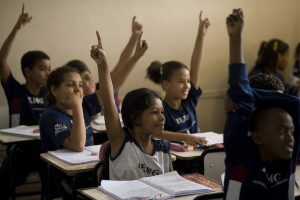 During the last decade, Brazil’s public investment in education increased steadily between 2000 and 2010 by 2.1 percentage points, from 3.5 percent to 5.6 percent. In the state of Rio de Janeiro, a focus on education has improved the performance of students graduating high school. From 2009 to 2011, the state went from 26th to 15th in a ranking that compares the quality of school across Brazil’s states. Rio has also made an effort to combat school abandonment, which decreased from 16.5 percent in 2009 to 14.4 percent in 2011. “That evolution is a reflection of a group of synchronized actions. When we took office in January 2011, our vision for the future was bad. With a collective effort, we were able to revert the situation and reach the established goals,” Wilson Risolia, the State Secretary of Education of Rio de Janeiro told The Rio Times. However, these numbers, though positive, do not reveal the full picture of education spending in Brazil. Latin America’s largest country still lags behind the average spending rates of countries in the Organization for Economic Cooperation and Development (OECD), which is 6.3 percent of GDP. While Brazil spends more than both Italy and Switzerland on education as a percentage of GDP, Brazil spends about US$2,960 per public school student, Italy invests US$7,830 and Switzerland, US$12,800 per student in a state-funded school. The difference is due to the fact that Brazil has a larger GDP than those two nations but also a much larger population. Smaller, wealthy countries are able to devote more resources to education per child. President Dilma Rousseff sanctioned the law that gives 75 percent of petroleum revenues to education last week, photo by José Cruz/ABr. Brazil also faces an uphill battle in ensuring an equitable distribution of education investments across the country’s 26 states and federal district. Numbers collected by national nonprofits show that investments vary wildly from state to state. The President of the National Association for Education Financing (Fineduca), José Marcelino de Rezende Pinto, told Agência Brasil that in 2011, investments per elementary school student oscillated between US$779 and US$1,313. In São Paulo, one of the country’s wealthiest and most populous states, the government spent US$1,189 per child attending elementary school, while poorer northeastern states like Bahia, Ceará, Maranhão and Piauí spent an amount closer to the minimum. Brazil may have made great strides in getting young children to school in the last decade, but keeping them in the education system until the end of high school, as well as having them meet education goalposts at the right time, has proven a challenge. In 2010, a bit over one half of Brazilians age eighteen and up had finished elementary school. Only 57.2 percent of teenagers between 15 and 17 years of age had completed elementary school. Additionally, spending the amount established by Brazil’s federal budget in education investments has proven another roadblock for policymakers. Up to June 22, 2013, the Ministry of Education (MEC) had spent less than one third of its budget for 2013. This means that only R$27.7 billion of the R$89.1 billion approved for student financing – 31 percent – had been invested at the halfway point of the year. However, investments in education and the budget allotted to them are set to increase this year. On September 9th, education guaranteed increased funding with the sanction of the royalties law that devotes 75 percent of those resources to education and 25 percent to healthcare. 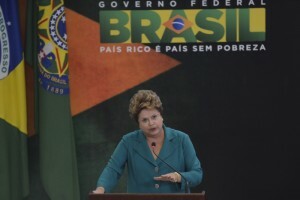 According to President Dilma Rousseff, those sectors will receive an additional R$112 billion in ten years, with R$770 million in 2013 alone.